Well I dropped my factory Fox shocks off at Total Control Suspension today near the house. They are going to revalve them to give me a smoother ride. I wanted to go with Bandits or 814s but I couldn’t get a clear answer if they would cause me any rubbing issues with my setup. I am running 14x8 0 offset wheels and 1.5 inch spacers with 28x10 Tusk Terrabites with stock arms. 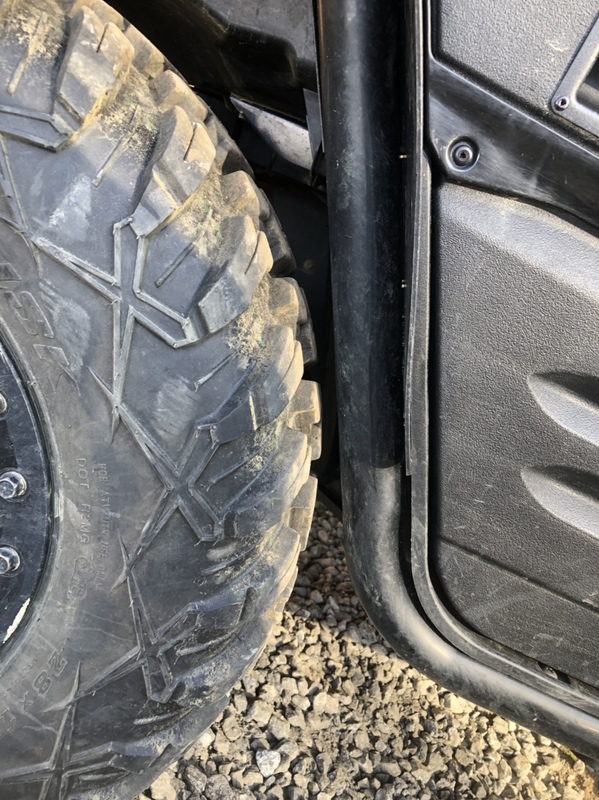 I was worried with the xtra travel that both shocks provided that my rear tires would rub the rear frame and I didn’t want that and I didn’t want to lose my width so I scratched that idea. Wasn’t going to by offset arms either to fix it. I also was told by both company’s I may rub the bed too. So that told me that they would probably rub the frame in the rear. I was only clearing by an inch in the rear with the brute performance lift. We will see how this goes. I’ve heard nothing but good things about this guy for years so needless to say I’m exited to try these shocks out. I just got the 814’s. They are awesome. I have 28” tires. With the initial preload I took them out with me, my wife, and four kids in the back. They rubbed on the little plastic tabs on the rear wheel well kind of behind the seats. After that ride I added preload to the rear and 3 more clicks for a total of 5 clicks on the shocks. I took it out for a long ride with me, my wife , 2 kids and a cooler. I ran it really hard in a couple sections and it never bottomed out or rubbed. When I say really hard I mean bouncing off the rev limiter in low on really tight and rough trails in the woods. We push this machine hard and the 814’s just float over everything. I was bottoming out all the time with the stock shocks. Something if you are getting your shocks revalved, you might think about some stiffer springs. I think that is a lot of the issue with the stock set up. Too soft of springs and too hard shocks. Jones, what size tires are you running and what rims? I just can’t justify that much money for shocks then have rubbing issues. If I knew a 100% sure I wouldn’t rub I’d own a set of bandits or 814s. I know for sure I want rub with the fox shocks. We talked about changing the springs but for now we are not. He actually has done a Teryx before that’s his buddies and they ride the same places I do, so I feel confident he can get them dialed in and have this Teryx riding better. I sure would like to know how your shocks turn out and what the cost per shock ended up, I'm in desperate need of a re valve on my T2. They should be back next Wednesday if not before. So I should know how they are by next weekend. This is an interesting idea. One I had not thought about. Maybe you would like to test them out with me in a couple of weeks? I am watching your builds very carefully so as to best plan my own. Daddy always told me, "Son, you have to learn from other peoples mistakes cause you don't have enough time to make them all yourself!" It isn't really about the shocks when it comes to rubbing. Its the tire/wheel. A longer shock wont have a shorter shaft allowing more up travel? When fully compressed the shorter shock will by nature be shorter allowing more up travel. The extra travel is 95% on the down travel side. At least that's how I see the mechanics of it...My bandits are not allowing more up travel causing rubbing but allow more down travel thus increasing total travel and incorporating limit straps if needed to limit too much down travel binding axle cv's. 28" is max size no matter the shock imop. So I have a question about this. I installed a highlifter 2" block lift to my Teryx. The instructions said that it might be necessary to notch the frame for axle clearance. Now, I did not need to notch the frame, but it is very close. I am thinking that you couldn't get much more down travel without binding up your axle anyway, so is it worth it to pay all that money for new shocks if you can re-valve your old shocks for what I assume will be a lot less money??? I thought bout all that. I ordered BP lift and Bandits. I returned the lift to BP. Too much and doesn't work. Can ya make these things work? Sure it can be done but then you sacrifice travel etc so what is the point. Dial up preload from shock to achieve lift and get travel and good riding shocks. So with Bandits alone I have close to same lift from 2" lift and great ride with more travel. That's my conclusion. A arm can only move point a to b. Using it all while having good smooth riding and increased lift is a chicken dinner for me. A revalve and lift isn't a bad option either but I doubt it would be as good as increased shock travel and lift. All about the Benjamins and terrain. I’m trying to work it out for in a few weeks. The best it has ever rode to date was when I had the SuperAtv offset arms on with the sway bar disconnected, 28x10 tires and 1.5 inch wheel spacers. I adjusted the preload on the shocks and played with the compression. 2nd best was with stock arms and the brute performance lift. Same wheels and tires as above. Preload set to about half what is called for in lift instructions. Sway bar still gone. 3rd is when it was stock. The larger tires with the same size all around are awesome. I rotate them and they handle great. I love the wide stance I got too. It feels so much more stable. Aftermarket bigger tires are so much better in my opinion than the factory bighorns. Plus I don’t like to have flats so I buy 8 ply tires. None of these mods have caused me any issues except for rubbing issues with the tires with a few set ups I’ve had. 99% sure you wouldn’t. I ran 28s stock with no lift and absolutely had no problems. That was on a zero offset wheel too. Don’t forget though that all tires are not created equal. Depends on tread patterns too. Just do your research on tires before you purchase. A true 28 is probably the largest you can fit. Most don’t measure 28 though. With some shocks you will need to remove the lift I believe because they are longer. I just wasn’t going to take the chance on it rubbing. Like I said too, I’m not going to give up my width. Probably could have took the spacers off and it not rubbed in the rear. When they both said that it may rub the bed under full compression that’s what turned me off. Maybe you can adjust the preload and avoid this but I’m no shock expert. This is under full compression in the rear right now with no lift on my Teryx. If those shocks give just slightly more up travel I’m rubbing unless I misunderstanding something. Maybe them being longer fixes this. I also found on another Teryx page where people have actually had rubbing issues in the rear from to much travel. Seems like most people running either brand of shock are also running offset a arms. So basically I’m just playing it safe and going to use my stock shocks. If the shocks are just 50% better I’ll be happy. Hoping for a 100% thought. But revalving the shocks are definitely a cheaper option. Might be a good option for some too. I’ll definitely give an honest review of them. If I’ve wasted money I’ll let y’all know. Barefoot, I'm not highjacking this post but I can not reply to your message, forum say I have not posted 15 times yet. Yep, I work at the Carrier store, I'm the old man in the middle. The TTB folks still ride and meet once a month. Not sure why you are locked out of the forum but I'll check for ya. I actually fixed it last night. It was me. Not the forum. Thanks. I’ll message you on the other board. I don't think the stock ride is that bad really. I removed the sway bar and set my shocks to full soft. The next best upgrade would probably be the a-arm bushings as I have heard MANY people complain that the stock bushings were extremely stiff. I think GP is the company that makes the better ones. I plan on switching mine out on the next maintenance cycle. Bushings. I just loosen the bolt a 1/4 turn. Super smooth then. 2018 seemed slightly better but the 2015 was a rock. I assume the BP lift helps with a change in geometry/angle on shocks? The BP lift does improve the ride by moving the shocks further in. I read how it works and why but I’m not going to try to explain it and get it wrong. Haha. I had bushings wearing out before 1000 miles so I went ahead and replaced them all but the hub bushings. Right side hub bushings had play at 1500 miles so went ahead and replaced both sides. Put GP bushings in everything. The GP bushings are a lot higher quality than the factory. It definitely let the arms move more freely too. Barefoot , I am glad to read someone actually tuning their shocks instead of just tossing them for a "better" (used loosely) set . I am not saying that Bandits or 814's are or are not quality shocks...but...I am saying Fox's are ; and , most peeps are just trashing them for bolt on replacements that "everybody else" says are better . I came to the kawi-world after many years in a Rhino (with Elka's) ; and , to me my T-2 (after swapping out rear springs) rides better than the rhino did . I am super interested in how much you ride changes after the re-valve ! Being that I am not "unhappy" with mine , I do not intend on changing anything until the warranty runs out. Do you have the info on the rear springs you changed to? They are either 450lb , or 475lb Racer Tech springs that a bud had left over from some testing he done . They aren't stamped ; and , he couldn't remember the weight for sure . I carry LOTS of "stuff" in my boxes , along with a cooler , and a spare tire in the bed . The added rate keeps you from having to crank the preload down to maintain ride height , resulting in a much better ride .